More comfortable pullback for added comfort! 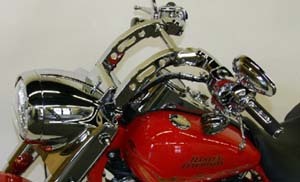 HB-01: Standard Electra Glide Handlebar. Polished with OEM measurements and specifications for internal wiring. Pre-fitting with left side standard handlebar grip. Fits '09-later Electra Glide®, Street Glide®, Ultra LimitedTM. 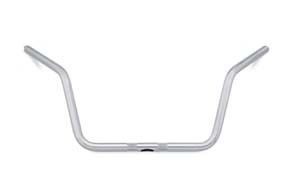 HB-01R: The Exta Rach Handlebar is shaped to provide all-day riding comfort for smaller stature riders. The Reach handlebar was ergonomically designed to provide the ideal combination of shoulder position, elbow bend and wrist angle. Fits '09-later Electra Glide®, Street Glide®, Ultra LimitedTM (except '10-'13 FLHTK) and '09-later Trike models (except FreewheelerTM). Also fits '17-later FLHTKSE and FLHXSE models. Does not fit with accessory Heated Hand Grips. All models require separate purchase of additional components. 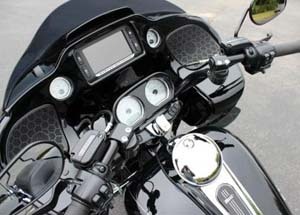 Street Glide® models and models with fairing-mount mirrors require separate purchase of handlebar-mounted mirrors and Fairing Plugs. Special Sale item. HB-01RC: Same as above but in show chrome. Special Sale item. FEZ-RD and FEZ-PT: Revolutionary interlocking bolt-together, two-piece design that makes installation a breeze. Install kits include everything to install the handlebars in half the time of other kits due to a design that only extends the existing clutch cable/clutch line and brake lines. No need to waste time and money replacing the entire existing lines/cables. Available in Round or Pointed Top in chrome or gloss black powder-coated finishes for '08 to current model years. 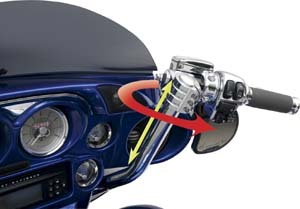 EZ Install: No more need to fight internal wiring with our EZ install handlebars. You can install wiring in minutes! 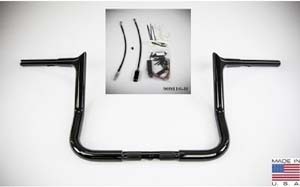 Our install kits include everything needed to install our handlebars in half the time of other kits. 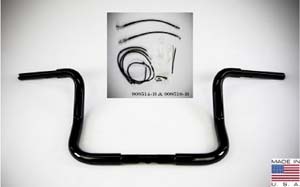 Black handlebars come with black lines/cable extensions. 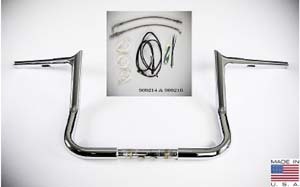 Chrome handlebars come with braided lines/cable extensions. NOTE: Our handlebar kits do not replace existing lines. We extend them! 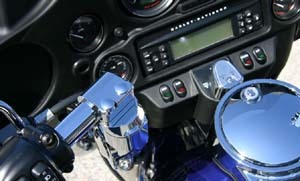 Pictured are 12" Chrome and 12" Black Handlebars. SPECS for 12": Width: 36", Center Width: 15 1/2", Pullback: 9"
MEN-BAR: Achieve the "muscle look" without the ugly bends. These 1-1/4" bars are a narrower, more comfortable alternative to beach bars, but still provide that thicker look. They are great for Fatboys, Heritages, Softtails, Sportsters, and more (will not work with stock risers on Springers)! Designed to work with stock length cables, wires, and now even fit with heated grips. All bars accept stock controls/housings, and are predrilled and slotted for internal wiring. 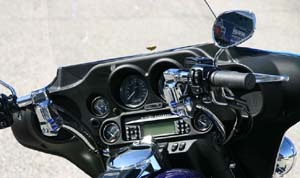 All bars are notched for Throttle By Wire applications. 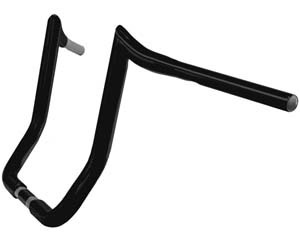 HZ-093: For 2015 Harley Davidson made significant changes to the Road Glide stock handlebars. Unfortunately, for most riders they didn't address the poor wrist angle in the bars. Not to worry, HZ-093 to the rescue! 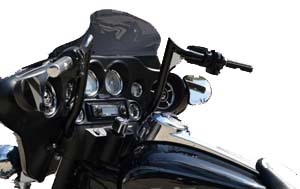 Introducing multi-adjustable handlebars for the Road Glide with 1 1/4" knurled mounting clamps. The only handlebars that offers patented 3 axis of adjustablity for superior comfort. 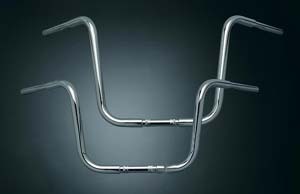 Made from DOM tubing; investment cast 8620 alloy steel clamps and pivots CNC machined from Solid 6061 Billet Aluminum, the HZ-093 handlebars offer increased comfort and control without fear of safety. The patented design takes into account several safety features and bars are torqued into place using the highest quality hardware for the most integrity. 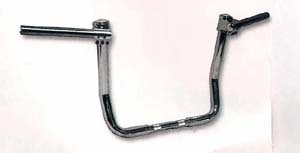 Handlebar tubes are slotted for wiring, bars themselves are not internally wired due to pivot points. 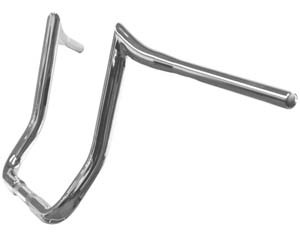 RG-P2, RG-P2B: Duplication of the stock Road Glide handlebars with an added a 2" rise for a more comfortable ride. Works with all stock cables, brake line and wiring including Fly By Wire throttle 08-10 FLH. Predrilled knurled and dimpled. Available in Chrome or Black powder coated finish. Fits '98 - '13 Road Glides. 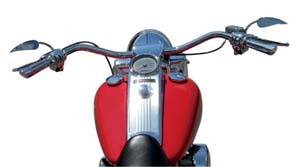 The primary obstacle to rider comfort is, “Some Cruiser handlebars don’t fit most riders. Wrist angle and reach are the key problems.” And swapping out traditional tubular bars can be time consuming, expensive, and still not result in a comfortable riding position. 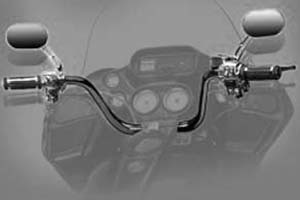 These adjustable handlbars' has a design that will fit a wide range of riders and motorcycles, and complement the look of traditional American Iron. Components of this new bar flow together with the over-all bike's design A state-of-the-art replacement handlebar kit that is mechanically precise and ideally adjustable, yet features a sleek appearance for the ultimate combination of form and function. These adjustable handlebars are CNC-machined from solid, billet 6061 aluminum and solid, mill-spec, low-carbon steel. These parts are beautifully finished in high-gloss chrome through the environmentally friendly Trivalent (tri-chrome) plating process. Depending on the model, usually only a braided front brake line is required for installation. HZ-110: For Electra Glides and Street Glides. 2” to 4” rear offset, 2” taller than stock, 15” swept bar. The HZ-110 with it's swept bar and revolutionary pivots offers the rider infinite possibilities for comfort. 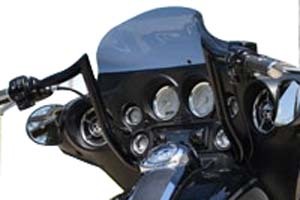 It is important to mention that the stock mirrors in the fairing of the Street Glide will have interference with the HZ-110. 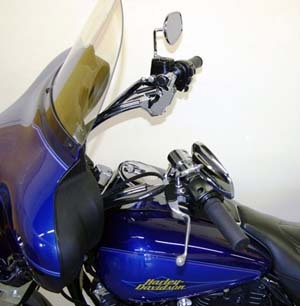 Customer are encouraged to use handlebar mounted mirrors to compensate. HZ-700: 7 inch risers. 2” to 6” rear offset, 31” width. The HZ-700 sports a lower profile while maintaining all the comfortable features of the taller bars. They are clean, simple and functional. 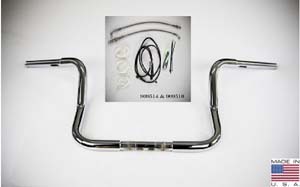 They require that your motorcycle have stainless steel braided brake lines for flexibility. 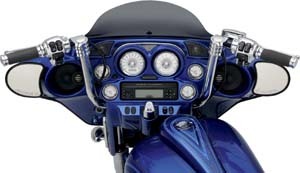 Please note: These handlebars will NOT work with the Electra Glide or Street Glide models because of the fairing design. HZ-825: 8-1/4 inch risers. 4” to 8” rear offset, 31” width. The HZ-825 has a distinct "arc" that brings the bar ends that much closer to the rider offering unsurpassed comfort for riding the distance. 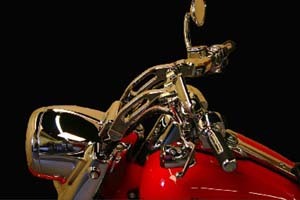 They require that your motorcycle have stainless steel braided brake lines for flexibility. 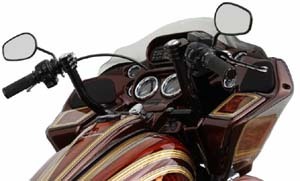 Please note: These handlebars will NOT work with the Electra Glide or Street Glide models because of the fairing design. HZ-900: 9 inch risers. 4 to 8 inch rear-adjustable offset, 31” width. 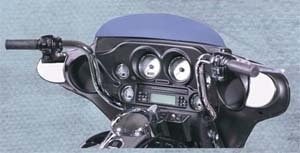 The HZ-900 with it’s unique "S" shaped riser is specifically intended for motorcycles with a Quadzilla type fairing. It also fits the Road King Custom as it sits neatly behind the chrome fly screen. 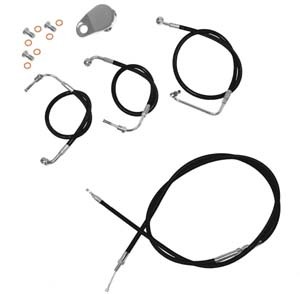 They require that your motorcycle have stainless steel braided brake lines for flexibility. 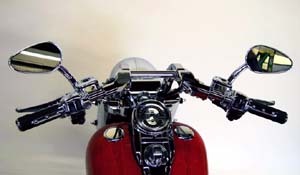 Please note: These handlebars will NOT work with the Electra Glide or Street Glide models because of the fairing design. APE-16: Ape Hangers...16" end rise, width 39-1/2". MDKW-12/14: Specially designed for the 2008-current models with the electronic throttle control sensor unit. 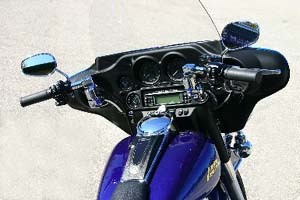 1 ¼” diameter formed handlebars with 1” center mounting section and 1” grip mounts. 12” and 14” versions available. Pre-drilled for internal wiring; knurled for non-slip clamping. Work with standard controls and grips. 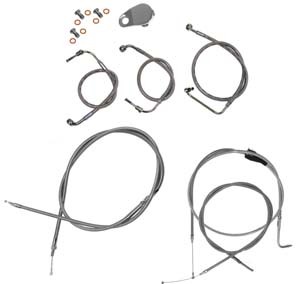 Harley-Davidson offers a Twist Grip Sensor Kit, p/n 32310-08 with 29” longer wires to eliminate wire splicing of the sensor unit (we can order it if you need...just let us know). Made in USA. BA-7350: A stellar custom bar itching to hit the streets! Specially designed to fit Batwing fairing models. BA-7350B: Same as above, but black instead of chrome. MUAP Line Ape Hanger: 1 1/4" O.D. 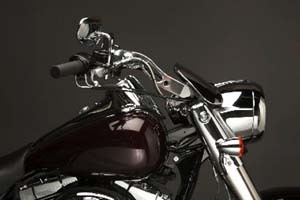 steel handlebars provide a massive look with a style right out of the 1950's. To keep the switch wires out of sight the bars have been dimpled (like the 1982/Later OE bars) and slotted under the switch housing area so the wires can be run internally. The brake side has been clearanced to be used with OE style master cylinders (all years including 1996/Later) and most custom brake master cylinders. Knurled at the riser area to help prevent slippage. Fits risers mounted on 3 1/2" centers. Chrome or Black. MUAP-25/60: Width: 30", Rise: 16", Pullback: 5 1/4", Center Width: 8 1/2"
MUAP-24/59: Width: 30", Rise: 12", Pullback: 5 1/4", Center Width: 8 1/2"
MUAP-26: Width: 30", Rise: 9", Pullback: 6", Center Width: 8 1/2"
MUAP-27: Width: 36 1/2", Rise: 4 3/4", Pullback: 5", Center Width: 9"
KWKH: The Klip Hanger Handlebars are one of the newest addition our line. These bars are very unique and look like nothing else on the martket. They will not only give your ride a cool custom appearance, but just as important, they offer all of the comfort you can only expect from a set of truly adjustable handlebars. Are you tired of your stock or other aftermarket bars? Then don't sacrifice comfort or looks - get both and hang on with the new Klock Werks Klip Hangers! 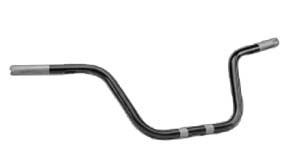 Innovative handlebars present the ultimate in rider personal adjustment and fit. Unique "Klamps" allow control/grip portions of the handlebar to be adjusted to your exact liking. Made for use on Street Glides, Electra Glides, Road Glides, Road Kings, Softails and many other custom applications! Direct bolt-on fitment for 2008 and NEWER Touring Models only. May require cable extensions, etc. Will also fit 1996 - 2007 touring models with '08 and newer FLH type Master Cylinder... Please call for details!!! All bars feature 3-1/2" on center knurling for 3-1/2" on center risers, and accepts up to a 5-1/4" riser top clamp. Conventional bars have a 12" center width, a 10" or 12" bar section height, and 30" grip-to-grip center width. FLHT/FLHX bars have a 17" center width, a 10" or 14" bar section height, and 37" grip-to-grip width. Bar sections are manufactured from DOM tubing. Klamps are machined from 6061 billet aluminum. All hardware is stainless steel. All bars are drilled / slotted for internal wiring. 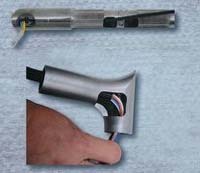 Bar ends are notched for throttle by wire applications. All include chromed billet aluminum domed bar end plugs for a finished look. Also works with heated grips! KWKH-BW: For 2008 to current Street Glides, Electra Glides, Ultras, Trikes with Batwing Fairings and other customer applications. See note above about fitment on 96-07 models. The FLHT / FLHX bars have a 17" center width, a 10" or 14" bar section height, and 37" grip-to-grip width. 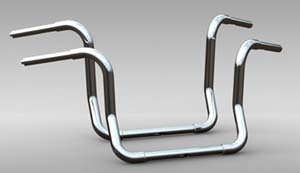 KWKL-RG: The conventional bars are made for use on 2008 + Models with 3-1/2" on center risers, 5-1/4" riser top clamp (works great for ROAD GLIDES, ROAD KINGS, SOFTAILS, Dyna, XL, and more!) See note above about fitment on 96-07 models. 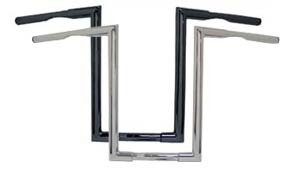 These bars have a 12" center width, a 10" or 12" bar section height, and 30" grip-to-grip center width. KWKL-VT: Also avaiable for Victory Cross Roads. Each kit includes the correct length Clutch Cable, ABS Tri-Brake Kit with Chrome T, Fittings, and Banjos with Copper Crush Washers. 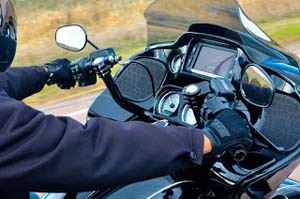 Note: To ensure the proper function and safety of your ABS brake system, have your motorcycle connected to a Harley Davidson Digital Tech to verify brakes are bled and ABS works properly. Failure to do so may cause harm or injury to you or your passenger. 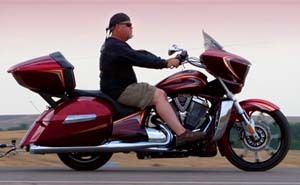 Revolutionary pivots offers the rider infinite possibilities for comfort!